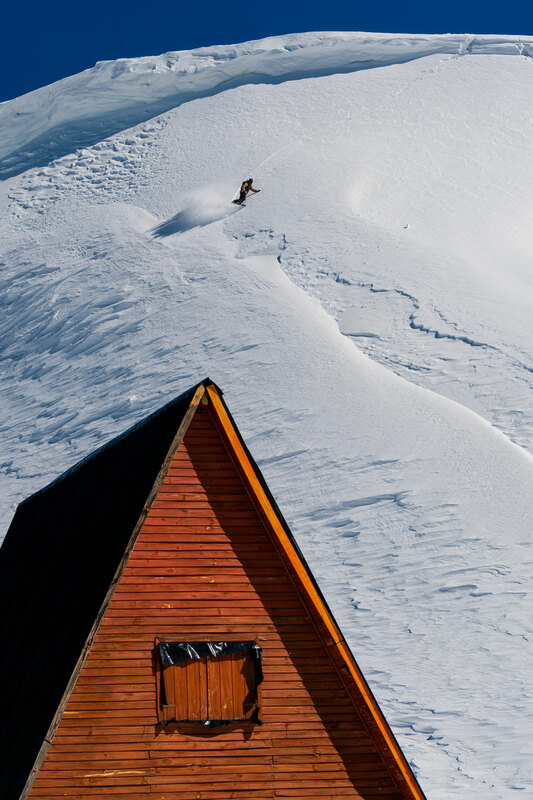 Skiers and snowboarders are part of a nomadic tribe that can be found dreaming about the next turn, sometimes traveling to great lengths in search of pow. This summer, as the days were getting longer and temperatures higher, I found myself longing to get away from the scorching heat in Whistler, BC. 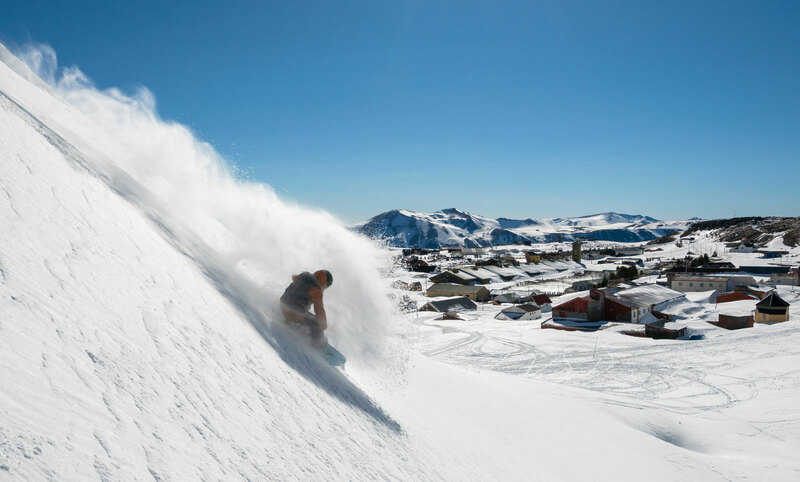 Traveling to the other side of the world to chase winter can be a roll of the dice. This August was low tide in Argentina, with storms not delivering the goods. However, things can change quickly in Patagonia. 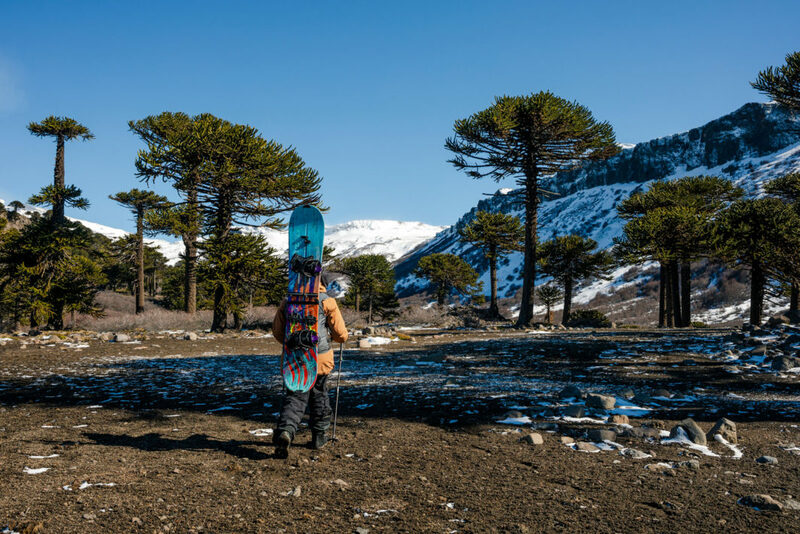 When I saw a storm lining up in the forecast, I pulled the trigger and booked a trip to Bariloche to meet up with local legend, Mauri Cambilla and photographer, Ben Girardi. With the forecast calling for an 80 cm storm on the day of my arrival, I crossed my fingers and started the 30-hour journey from summer to winter. By the time I landed in Buenos Aires, the snow had evaporated from the forecast. It was clear when I arrived in Bariloche a few hours later that there was only snow in the high alpine and things were looking shallow at best. 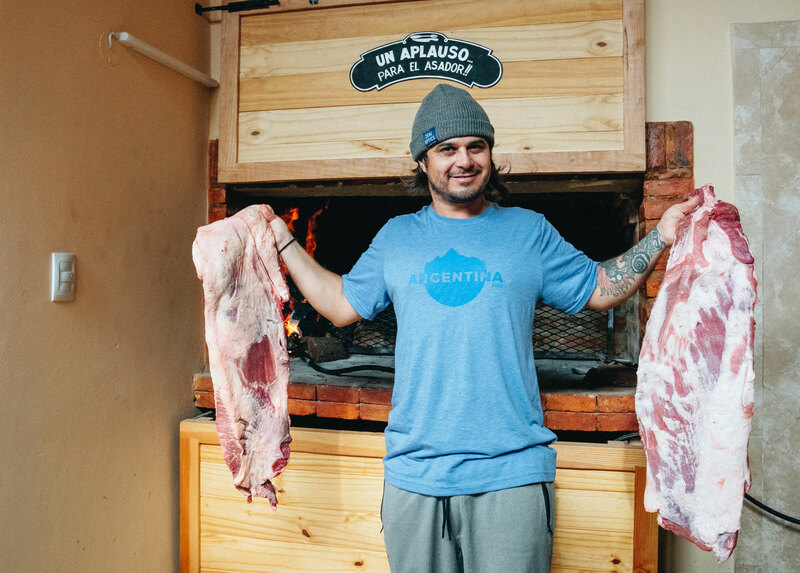 One thing that was still delivering in Argentina was the asado that Mauri cooked for us that night. A ridiculous amount of beef slow cooked while we talked about our options. 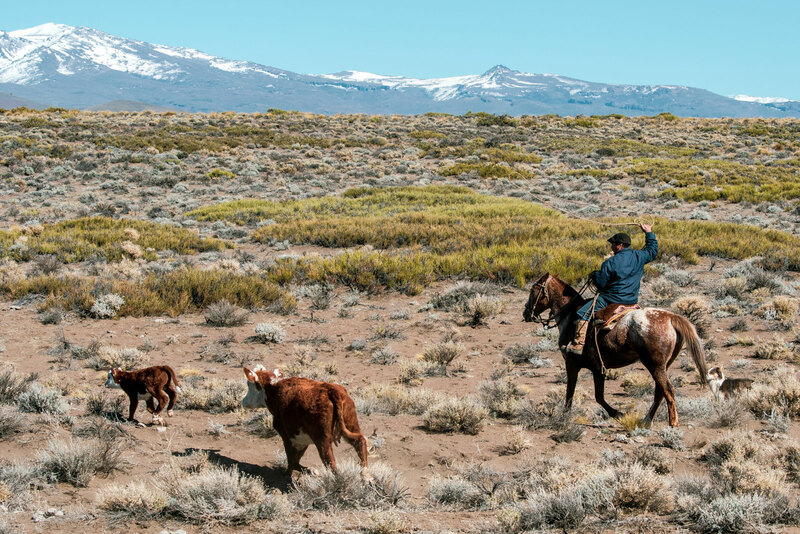 With our stomachs full of incredible Argentinian beef and teeth stained red from delicious Malbec, our spirits were high even though the snowpack was low. Mauri suggested we head north to a town called Caviahue. 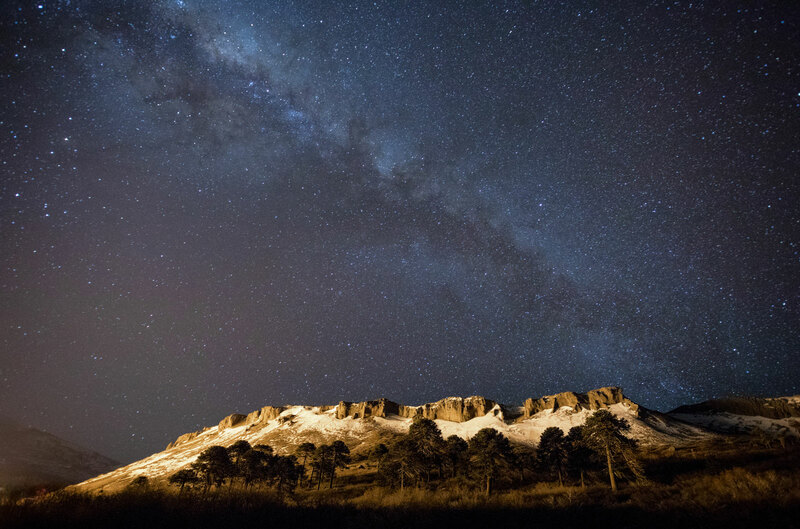 Caviahue is nestled in the middle of the Andes and known for its amazing terrain and heavy snowfalls. If anywhere in the country was holding snow, we would find it there. With the forecast calling for snow, it was the best option. The plan was set, we would head north in the morning. After six hours of driving, we made our final climb into the mountains. As we arrive in Caviahue, the wind howled and the sky darkened as rain fell in sheets. Caviahue was very evidently a ski town. We passed driveways filled with 4×4’s, snowmobiles and crazy looking snowcats as we pulled up to our home away from home. We rushed inside to get out of the storm. The wind was blowing so hard that cracks in the windows whistled as if it was a recorder that Pachamama was learning to play. We awoke the next morning to blue skies and no sign of a snow line. It had rained higher than we hoped. Remaining cautiously optimistic, we decided to head up to the resort to get a chairlift bump into the alpine. Since touring from the valley was out, maybe we could make “plan b” work. As soon as we pulled into the parking lot, we knew that we needed a “plan c”. The volcano that the resort sits on was spewing smoke and ash. While nobody seemed too concerned with the change from steam to ash, it left us reconsidering wanting to get close to the crater. The ash and steam had melted what little snow had fallen, forcing the upper lifts to close. With little to no snow covering the mountain, one magic carpet was still spinning. 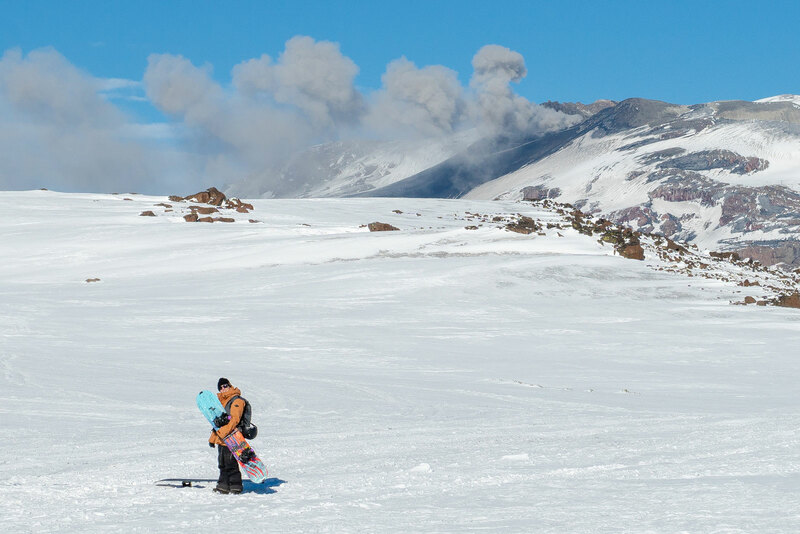 It serviced a handful of either very brave or blissfully ignorant beginner skiers and snowboarders just trying to stay alive as they navigated around patches of rock and grass on the small icy slope. Out of the corner of my eye, I spotted a face of a mountain relatively close by that seemed to be holding snow. While it was most likely going to make for average riding at best, Ben and I decided it was worth it to go exploring. With no other plans and not much to lose, we strapped our boards to our packs and set out for a little adventure boarding. We had about a 1000-meter elevation gain and a small creek to cross to get to our objective. It seemed like an achievable goal. 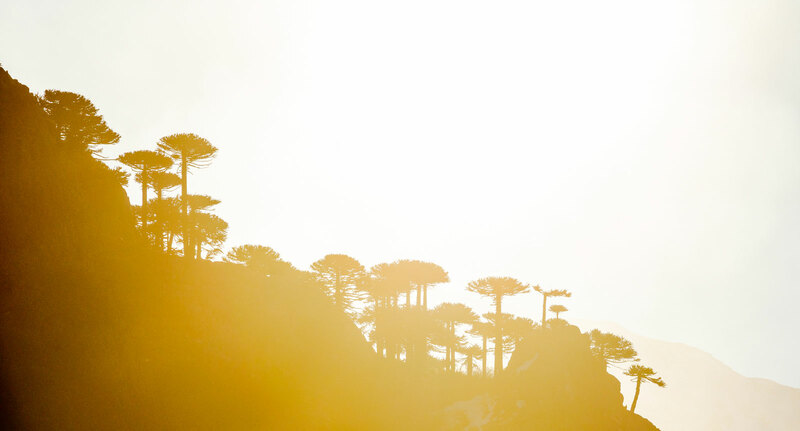 Winding our way through the prehistoric forest filled with magical araucaria trees, we searched for a place to cross the creek. As we got closer, the creek began looking much more like a river. Proving a little more difficult than we first imagined, we found a sequence of rocks that worked as a crossing. After putting far too much trust into collapsible poles, we made it across the river. That’s when things shifted into “type-two” fun. Slogging through chest-high brush, throwing our boards over and climbing under to find them, we fought our way to the snow line, or what was left of it. A mix of patches of snow, grass and bush, we decided to boot pack until the snow became more consistent to transition to splitboarding. Within the first 100 meters of crossing consistent snow, we decided to turn around. The snow was garbage. It consisted of a refrozen rain crust on top, and hollow rotten snow underneath. We had finally made it within reach of our objective, but knew it was a better call to retreat. We strapped in and did a few sketchy turns on our way down for good measure. Then we decided on an easier objective, pizza and beer. 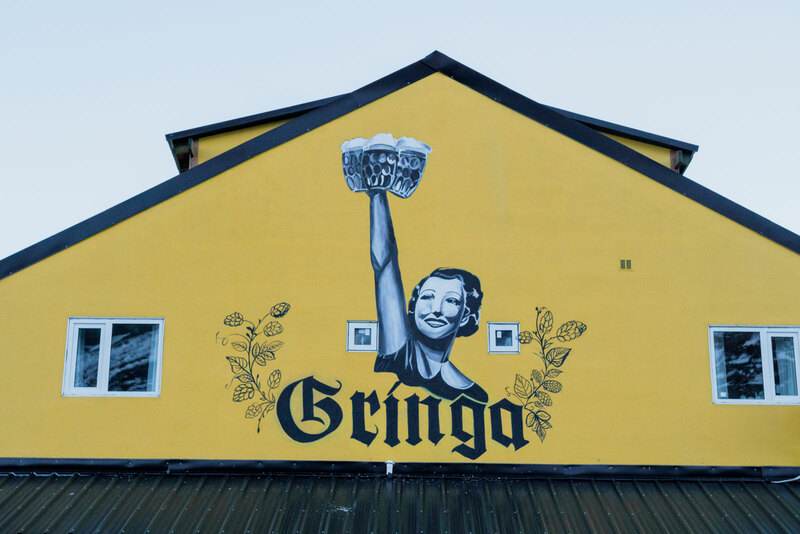 Thankfully Caviahue was able to deliver on good pizza and even better beer from a local craft brewery, La Gringa. A few pints and pizzas later we had a new plan. 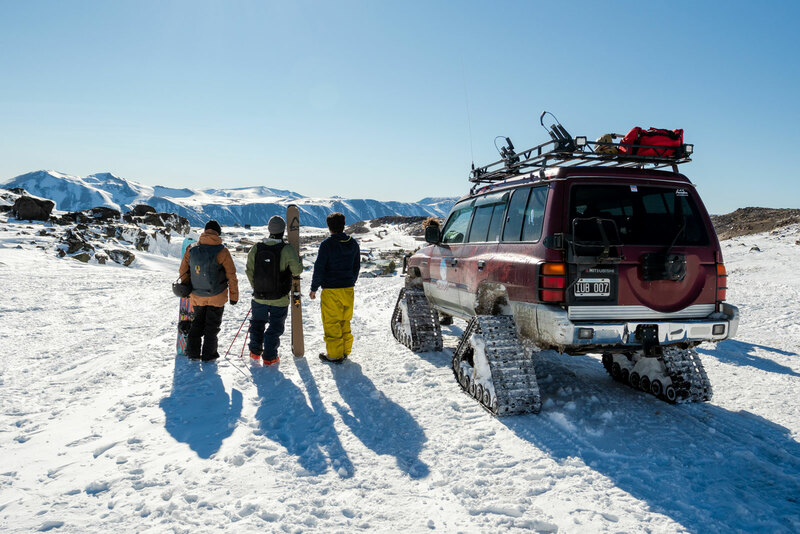 Working his local connections, Mauri spoke with the owner of a local backcountry company, Caviahue Adventures. The owner Andre had a few extra seats to go out to Copahue the next day, a tiny town high in the Andes. It was an easy decision to go as he described the giant natural hot springs and amazing terrain surrounding Copahue. He was confident that we would be able to find some snow out there. 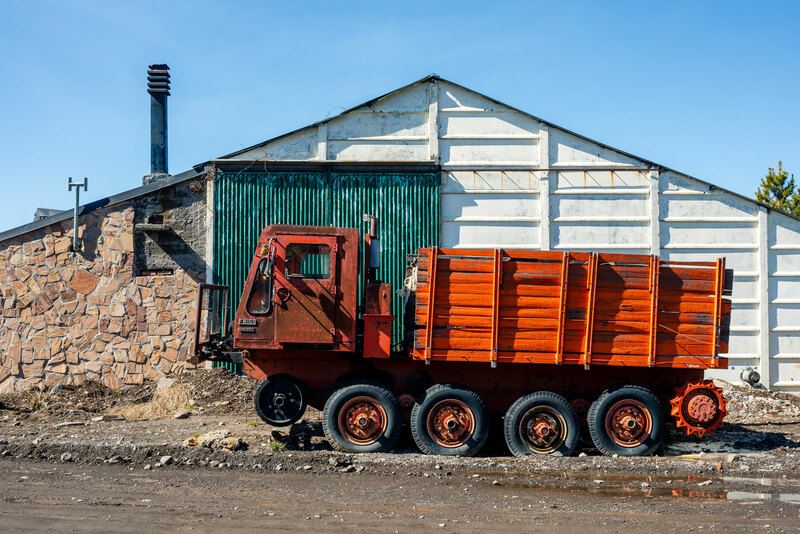 Copahue is only accessible by road in the summer, so we were stoked to have an opportunity to get out there in the cat track adapted trucks. After driving up a dirt road to access the snow line, we hopped in the snow trucks and cruised through the snowy tundra. Copahue is a town that sits in a former caldera of an extinct volcano. When we arrived, the town emerged below us in the valley like a snowy mirage. 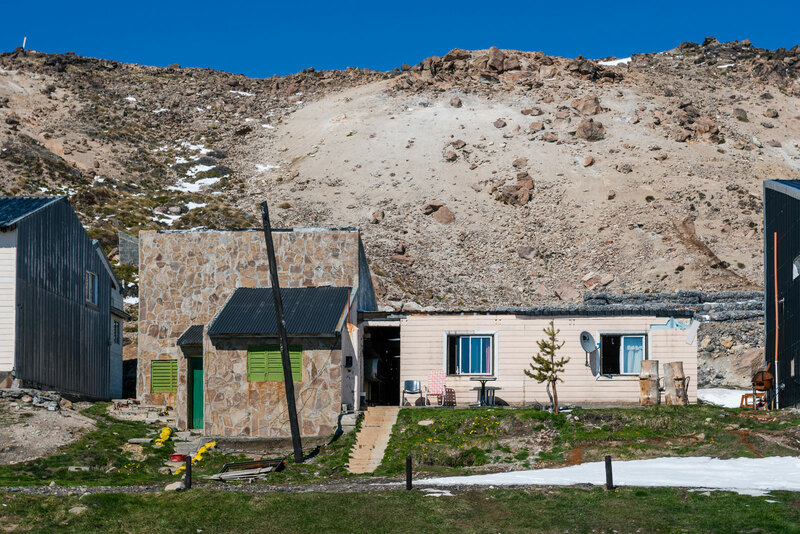 A-frame cabins, small houses, and even a lodge were built around a massive hot spring in the center of town. We hopped out of the truck and transitioned, setting out to explore the unique features surrounding the town. Pleasantly surprised by the snow quality, we rode lines that fed us back into town all morning. We stopped for a quick lunch at the one place that seemed to have people hanging out. It was there that we shared a maté with one of the town’s only year-round residents, Mario. Mario was the chef at the one operational lodge that served as a base camp for Caviahue Adventures. He was stoked to see more splitboarders in town and invited us for a tour of his house that had natural radiant heating thanks to a fumarole. Andre arrived back to the lodge with his other clients. They had finished for the day and he offered to give us a sled bump out to some bigger, steeper terrain. With the easily accessible lines surrounding town tracked out, we did not hesitate to take him up on his offer. Not long after, we were looking down from a ridge line about to drop in on perfect, light, fluffy pow under blue skies. It was a miracle. We found the goods. Quick touring laps ensued for the rest of the afternoon with everyone getting lots of turns, face shots and high fives. 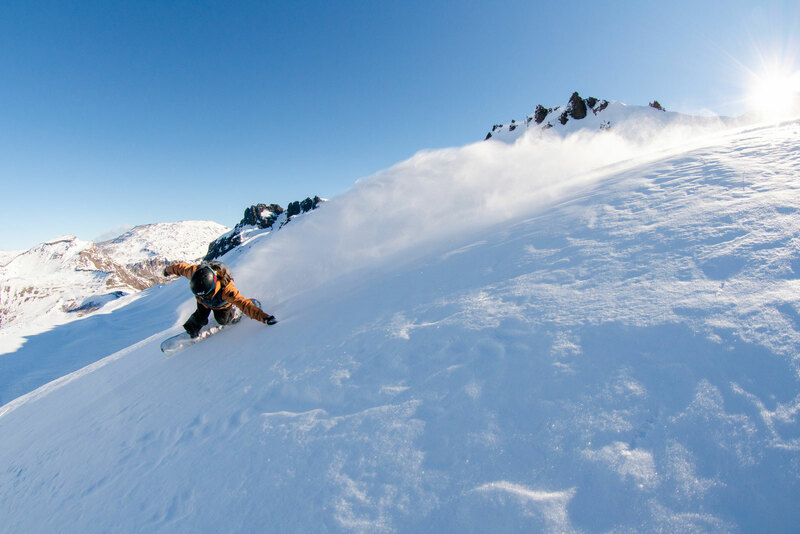 In a perfect corner of the Andes, we lapped line after line of perfect powder, weaving around the amazing terrain. 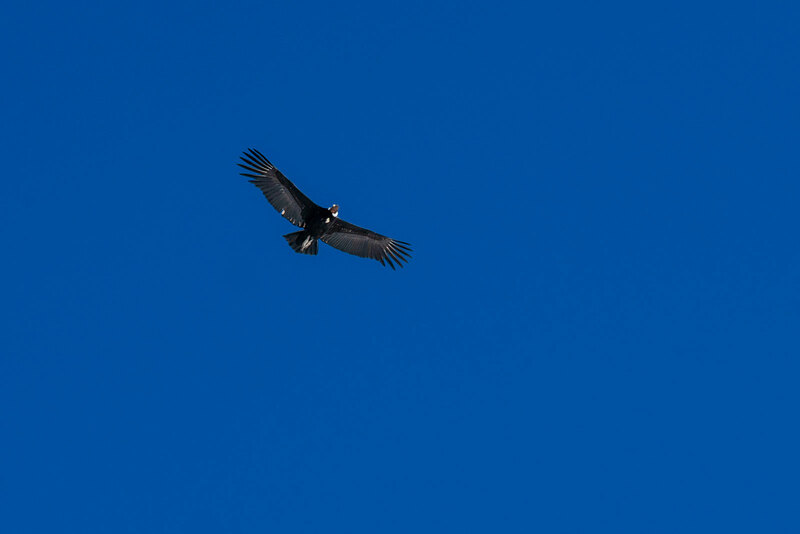 As the light started to fade, a pair of condors buzzed around close overhead, either watching the show or looking for dinner. 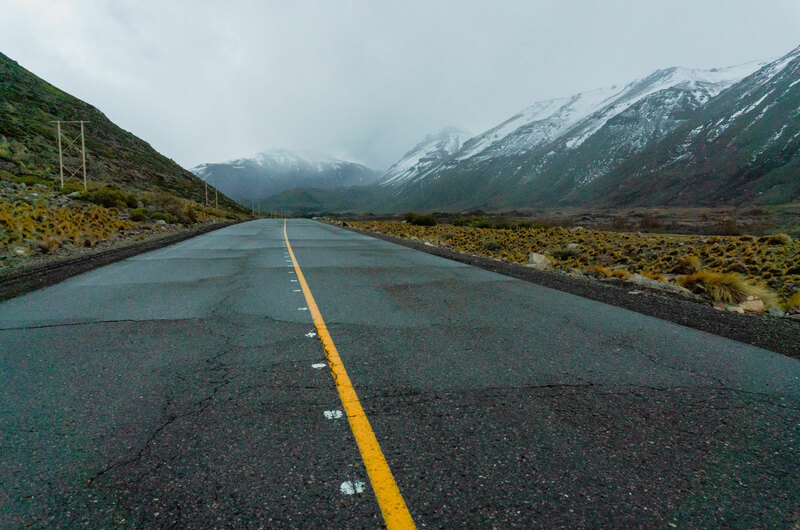 We didn’t wait too long to find out and started the journey back to Copahue. Upon returning, our friend Mario was waiting to show us the hot springs. He insisted we test the waters before leaving. 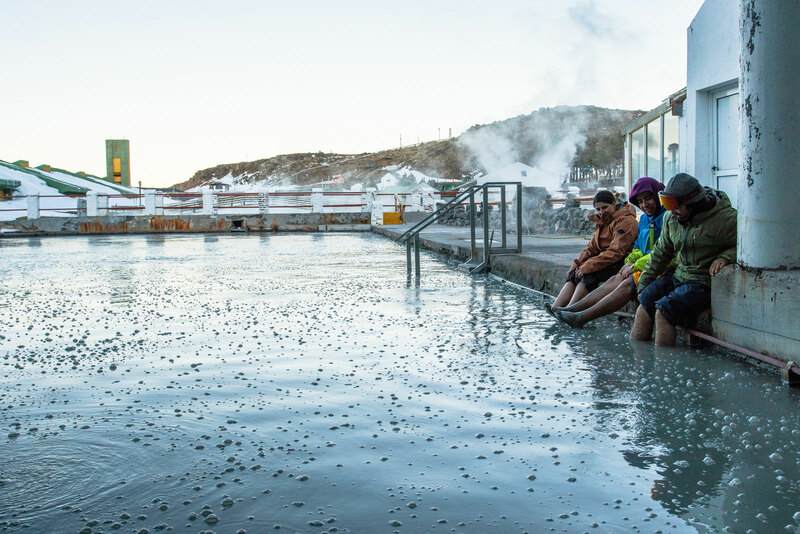 He took us to a mud bath first, explaining the healing properties of the warm mud before leading us to the perfect hot pool for après ski with seats designed for dipping your feet in. We all agreed that it was the perfect end to an awesome day. We arrived home well after dark and looked up to the terrain surrounding Caviahue, planning to come back another year to ride. While we had finally found snow way out in the Andes, it only left us wanting more. 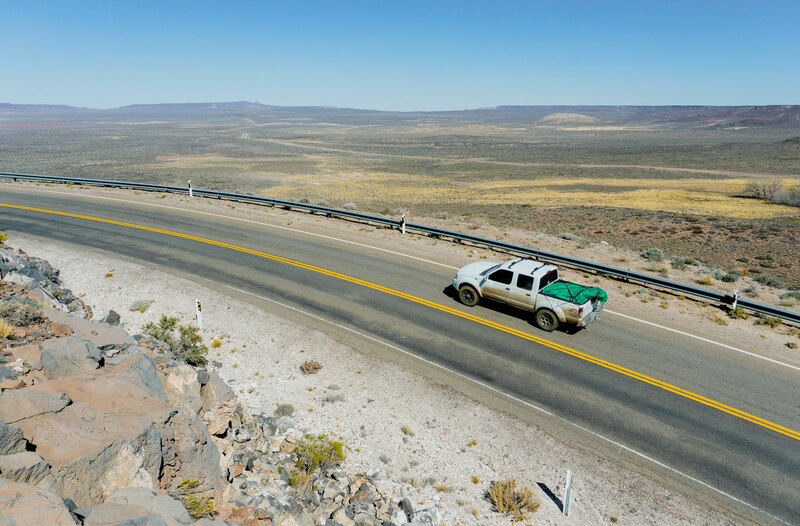 We started the journey back home the next day, following Argentina’s classic route 40. It’s known to be the longest road, winding through the countryside of Catan, filled with fields of wheat and sheep. We watched out of the truck windows as Gauchos herded their cattle and the mountains grew distant behind us. Another adventure was complete with a new winter on the horizon. The snow finally arrived in Argentina the week after we got back to Whistler. 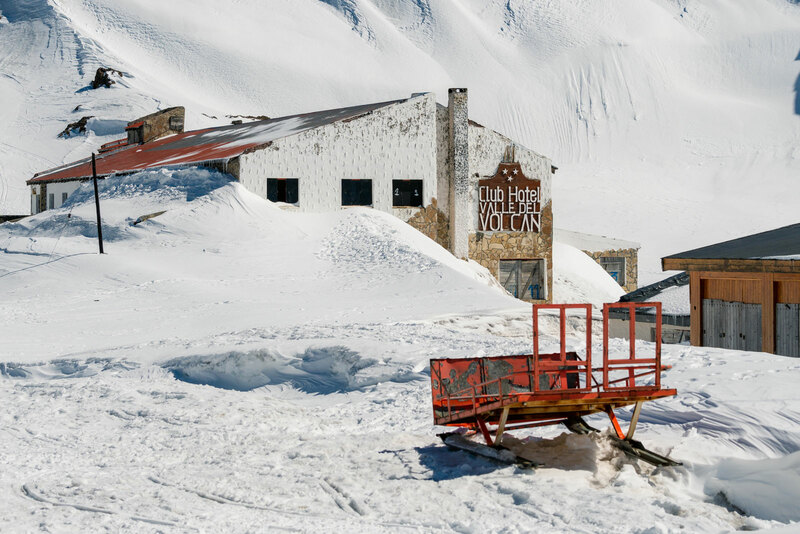 Meters of snow fell in very tail end of the Southern Hemisphere’s winter season. We can’t control the weather, sometimes you get lucky and sometimes you don’t. 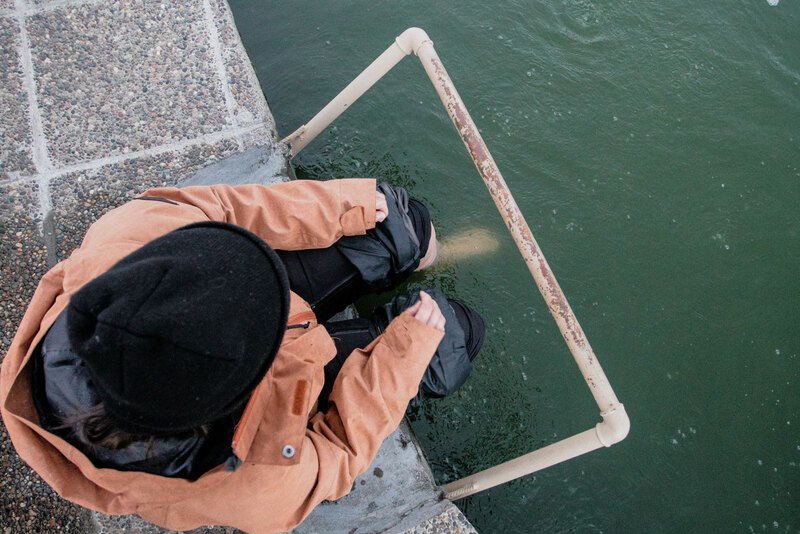 Whatever the weather brings, adventure is always worth searching for. Jen grew up in the shadows of the Coast Mountain Range in Vancouver, Canada, and fell in love with exploring in the backyard mountains at an early age. 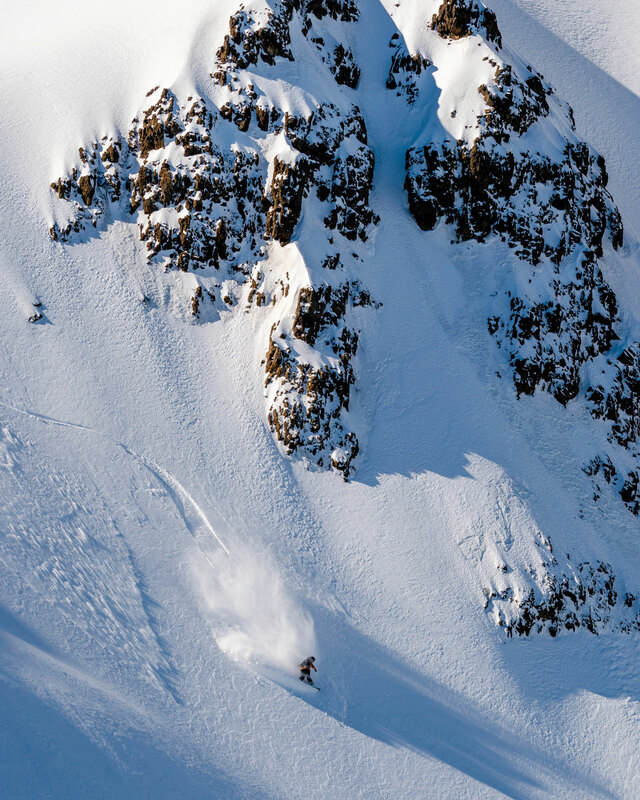 It wasn’t long before she was found herself traveling in the mountains on a splitboard. Now based in Whistler, B.C. 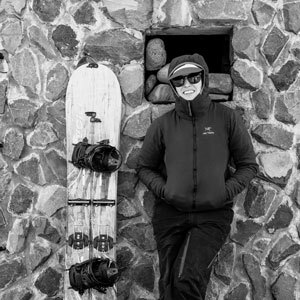 Jen can be found discovering new lines or sharing her passion for the mountains as a coach. 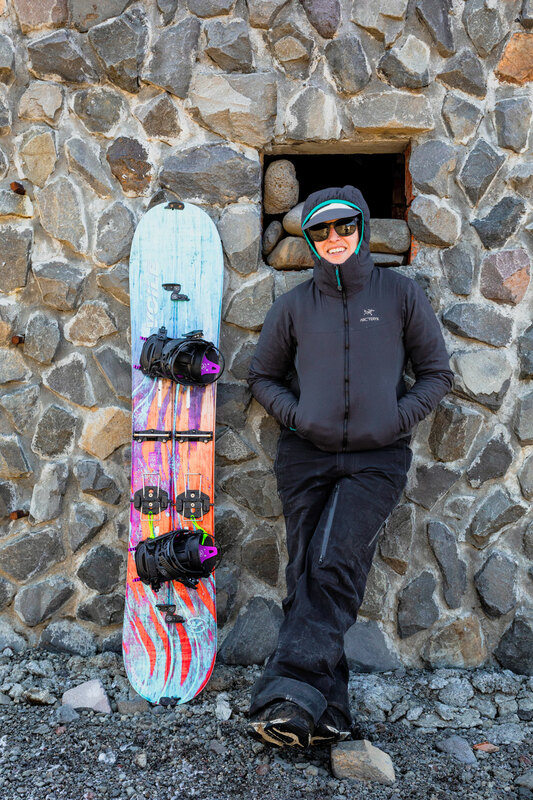 In the summer months, Jen can be found hanging out in the mountains rock climbing or flying south, chasing snow and adventures in Chile and Argentina.